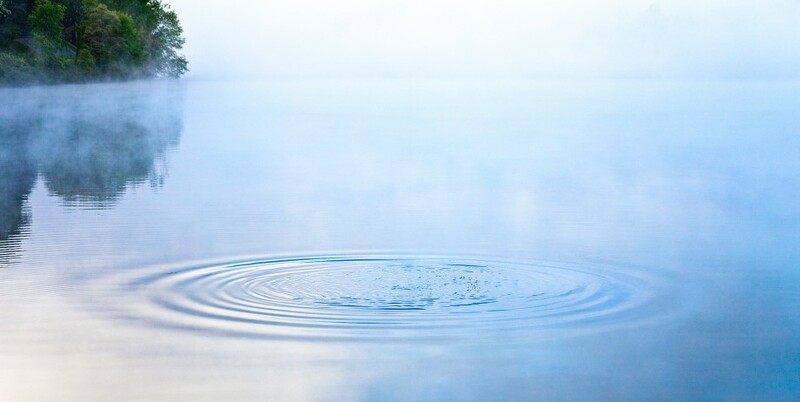 Drop a pebble in a pool of water and waves ripple out. Drop a word and thoughts ripple out. So too with emotions, behaviors and all the products of creativity. At some level, given enough time, everything affects everything. And everyone. Expanding on last week’s posting that dealt with rippling influence, I though I would provide the entire image that I use for my home page this time because it illustrates a fundamental property and process of the universe and everything in it. Energy and expansion. From photon to cosmos, whatever the matter or medium, energy characteristically radiates out in waves. I find it fascinating that, in this image, it’s not the water that’s radiating, it’s the energy moving through it. Had a cork been floating three feet from the center, it would have bobbed up and down but remained in place. For whatever reason, this image peaked my appreciation of energy itself. Although physicists don’t know what it is, they know a lot about its properties, effects and measurement. The textbook definition of energy is the capacity of a system to perform work. And work is defined as the movement of a force through a distance. That being the case, it seems to me that force is movement itself. Nothing in the universe stands still. Even the atom with its myriad of sub-atomic particles (more appropriately considered fields although they are still discussed as particles) cannot sit still. And that begs a fundamental question. If the substantive characteristic of energy is movement, how did it get started? And what sustains it? What is it that actually moves? As a working hypothesis I’ve adopted the notion that consciousness is fundamental. Whatever it is, it precedes matter. So could it be that within matter there is—both grand and rudimentary (as in rocks)—a “desire” to expand? To express? I like this idea because it ties to affinity or love energy, which seeks expression and therefore expansion, a view consistent with my belief that the universe is constituted of this energy, and that the evolution of matter provides the medium through which it expands. Of course these ideas raise questions that cannot be answered definitively, but the expansion of this kind of mental energy itself, call it dreaming, speculating or envisioning helps us create meaning and approach the Great Mystery. Where there’s a question there’s always the potential for an answer. And that provides some satisfaction. In this regard I observe that the surface of the pond in this image is largely obscured by fog that is clearing somewhat. As a species we may as yet be seeing through a fog, but what we are seeing so far is exquisite beyond words. On a more personal level, the radiating waves evoke in me a quiet and soft sensibility that speaks to the potency of influence that occurs when the thoughts and expressions that ripple out are coherent with the deep currents of life, as opposed to the big splashes that are so bold and dramatic they interfere with or distract us from these currents. An example of this would be the energies of mass media adolescence, sensationalism, hype and trash-talk. Of course there’s a time and place for both excitement and calm. Wisdom, I suppose, has to do with discernment and finding the balance. Any being with energy will disperse that energy. To radiate is the law of the universe. And this is true of all manifested reality… The universe cannot contain the magnificence it houses. Instead, it is compelled to express itself in ten million different ways. May 19, 2009. 7:18 a.m. I like to take two or three overnight photographic road trips each year, most of them within a four-hour drive from Cincinnati. On this particular trip I got up two hours before sunrise so I could be on location to photograph the dawning and then shoot as long as the light held. When there are no people around and the only sounds are those of nature—birds, frogs and ducks on this particular morning—it’s easy to get in the zone. It’s like the mind steps aside and the soul takes over, responding to moments of joy as the eye scans for compositions. As I think about it now, there’s a release of thinking and an activation of allowing that occurs—letting the energies of attraction direct my attention, and then letting the deep place of intuition determine whether or not the elements within the frame constitute an image that works. When I arrived at Lake Logan in mid-state Ohio, the fog was too thick to shoot. It was cold so I just sat in the car with the heater on. 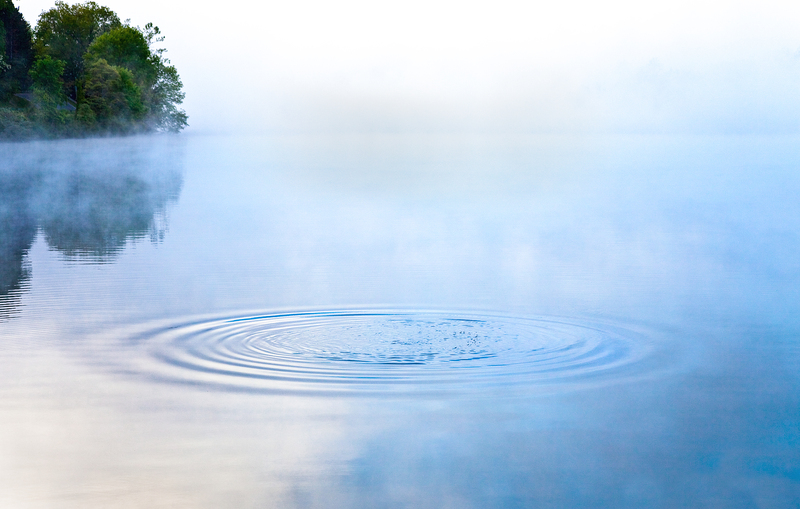 Gradually, the fog began to lift and the water was perfectly still. I made several exposures, all delightful. Then I picked up some pebbles and threw them one at a time as far as I could so the rocks and reeds along the shoreline wouldn’t show in the frame. With each toss I waited for the ripples to spread out before clicking the shutter. A tripod would have restricted my ability to center the circles since I couldn’t predict where the centers would be, so I held the camera with one hand and threw pebbles with the other. To insure that the image would not be blurred I increased the ISO setting to enable a fast shutter speed and set the aperture to f11 so the depth of field would keep the expanding circle in focus. © Copyright, David L. Smith, 2014. The images and the associated contemplations on this site are protected against any and all commercial and promotional use without the permission of the author. However, permission is granted for individuals to download the images and print them for private, non-commercial, non-promotional use. This entry was posted in Uncategorized and tagged atom, consciousness, energy, expansion, fog, force, life, love, matter, meaning, motion, movement, mystery, ripple, System, Universe. Bookmark the permalink. Remarkably beautiful photo, David. Thanks so much for the technical back-story!